Instructions and Guidelines: Add 20 grams per 8-fl. oz. of purified water in a clean mixing container and stir to dissolve; dose the resultant solution to the aquarium system as required to maintain the calcium concentration within a range of 412 - 450 ppm. Up to 100 g per 8-fl. oz. of purified water may be mixed at once. 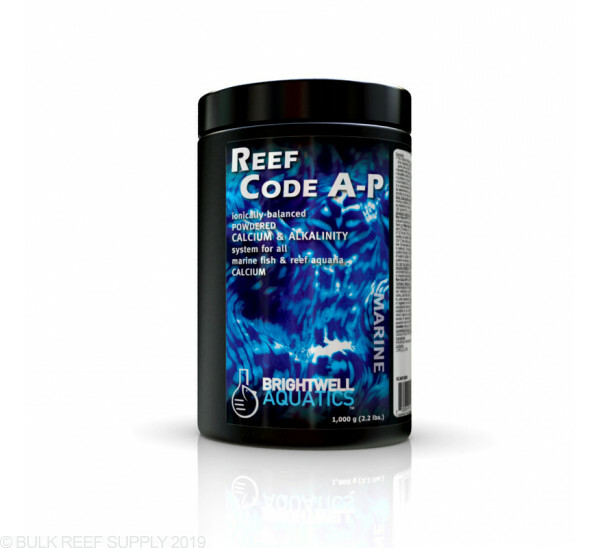 Instructions and Guidelines: Create a stock solution by dissolving 70 grams of Reef Code A-P in 8-fl. oz. of purified fresh water; each ml of the solution will increase the calcium concentration (“[Ca2+]”) in 1 US-gallon (3.785 L) of water by ~20 ppm. [Reference: Each g of REEF CODE A-P will increase the [Ca2+] in 1 US-gallon (3.785 L) of water by ~87 ppm.] If initial [Ca2+] in the aquarium is below 412 ppm, add stock sol’n at maximum rate of 10 ml per 20 US-gallons daily until desired concentration is attained, then dose daily or weekly as needed (see below). Maintain [Ca2+] within a range of +/-10 ppm. Once desired [Ca2+] has been acquired, measure aquarium's [Ca2+] at the same time each day over a one- to two-week period to determine the daily rate of calcium uptake (i.e. the decrease in calcium). To determine daily dosing rate: estimate volume of water in entire aquarium system (US-gal. ); divide the daily decrease in [Ca2+] by 20; multiply this number by volume of water in system to obtain daily ml of stock sol’n required to maintain stable [Ca2+]. Dose system as required to maintain desired calcium and alkalinity (using Reef Code B-P) values. Do not mix solutions together; this will cause the active components to precipitate and become ineffective. May be mixed individually in large containers and dosed with a drip- or automated-dosing system; ensure that solutions are entering the system in different areas to prevent precipitation. 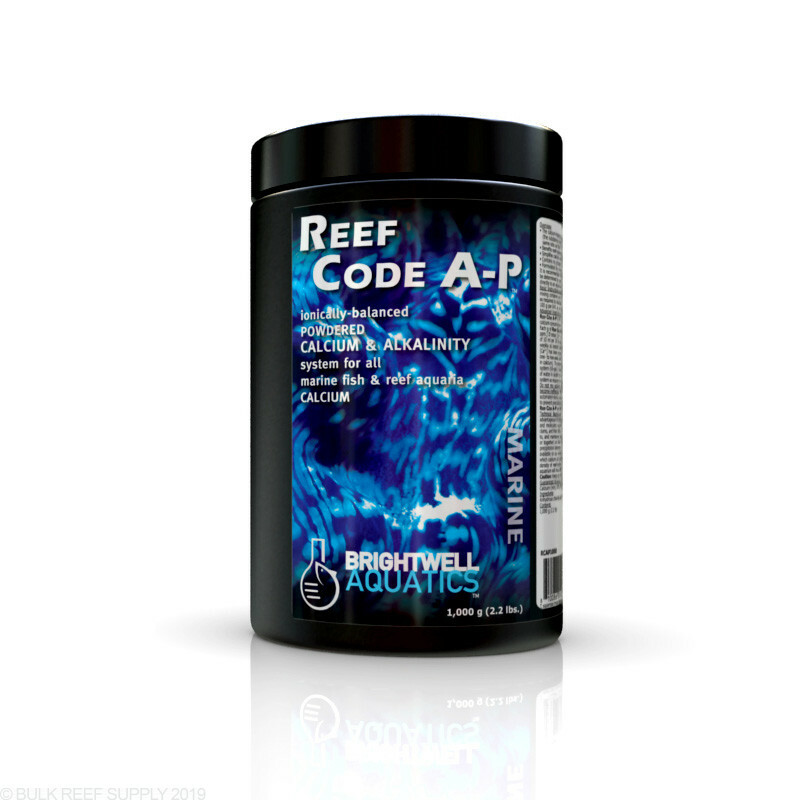 If dosing manually, allow at least 5 minutes to pass between dosing Reef Code A-P and B-P solutions. It is recommended that calcium and magnesium concentrations in the aquarium system be determined by using accurate test kits prior to supplementing. Do not add this product directly to an aquarium containing live animals without first diluting in water as directed. Technical Background: This method of calcium and carbonate supplementation is advantageous to hobbyists interested in a simple and effective means of providing elements and molecules required for skeletal growth of reef-building organisms such as corals, clams, and their allies. The magnesium concentration in all reef aquaria should be adjusted to, and maintained between, 1,290 - 1,320 ppm before using these supplements (alone or together) or other calcium and alkalinity products. Doing so helps prevent unwanted precipitation between calcium and carbonate ions. A concentration two part solution that stay in solution. I use ~16mL Both Ca and ALK in a heavy SPS dominated reef with a 20 gal net volume sump. Heavy= 105 frags, ranging from 1/2" to fist sized colonies. That being said, after researching, Reef Code A&B uses less than ESV and is taking care of my daily uptake needs. A little goes along way. Very satisfied here. I use the DOS from APEX. At times I adjust the DOS weekly up to .5mL for the growth intake. (LED/HALIDE). 4 stars, because this two part does not have trace elements in it like ESV does. Oh well. In standard measurements, teaspoon/tablespoon etc, what does the 70 g work out to?